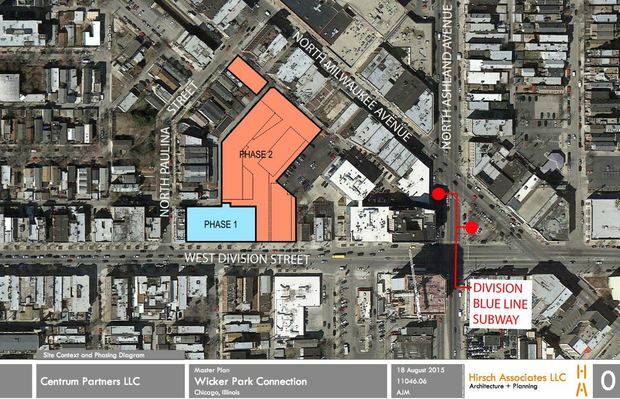 WICKER PARK — A plan for 275 new apartments, restaurants and retail storefronts between Division Street and Milwaukee Avenue — all connected via a serpentine-shaped pedestrian-friendly pathway — is in the early stages, but getting Wicker Park leaders pumped nonetheless. "I think it will be an asset to the community. 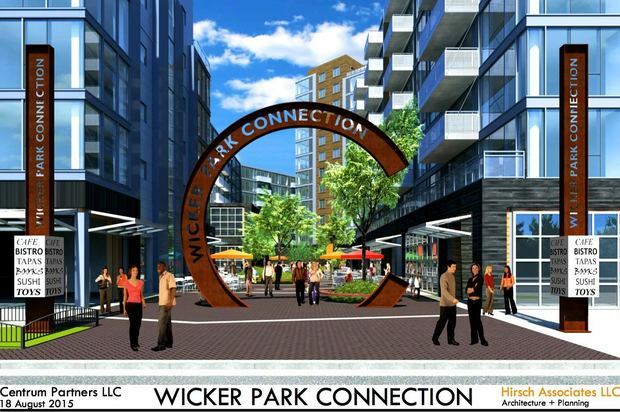 Hopefully they can make it from vision to reality," said Ed Tamminga, chairman of the Wicker Park Committee's Preservation and Development Committee after a meeting in the park field house, 1425 N. Damen Ave., where the plan was introduced on Tuesday. Grant Drutchas, another member of the oft hard-to-win-over neighborhood group, called Centrum Partners' plan "very ambitious." "It would be impressive [if it happens]," Drutchas said. Dubbed the "Wicker Park Connection," the massive 77,000-square-foot project over 2 acres of vacant land would get started after Centrum builds a six-story, 60-unit apartment building at 1660 W. Division St., just west of Ashland Ave.
That building, expected to be completed by next summer, requires the demolition of a 103-year-old storefront, home of Wisla Cut-Rate Liquors, a recently shuttered dive bar. 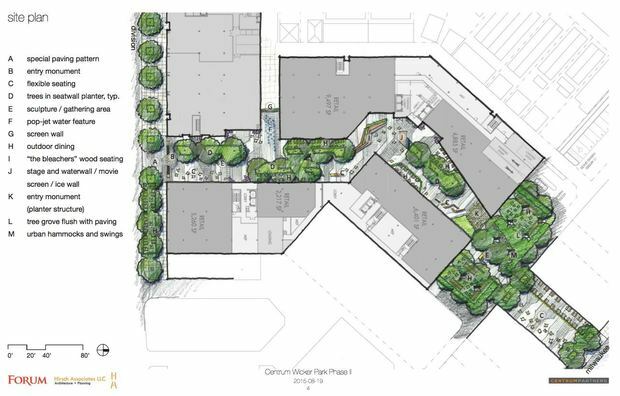 The pathway, which Centrum is calling "Phase 2," would be built next to the 1660 W. Division St. building. It would extend north and create a new pedestrian passage between Division Street and Milwaukee Avenue, anchored by three new buildings: seven, nine and 12 stories each. 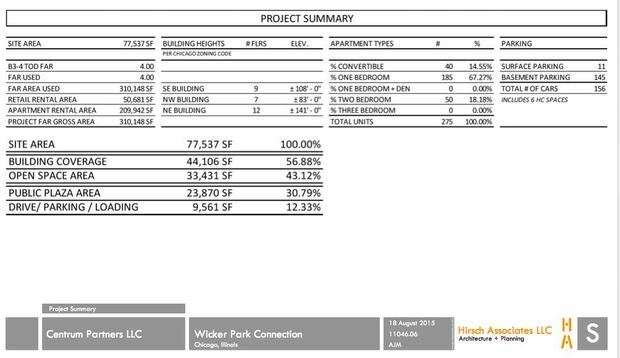 The buildings, to be designed by Hirsch Associates architects, would offer a combined total of 275 apartments, the majority one-bedroom, with the average dwelling size about 708 square feet, according to a site plan. The plan also includes 50,000 square feet of retail and restaurants divided into five storefronts. 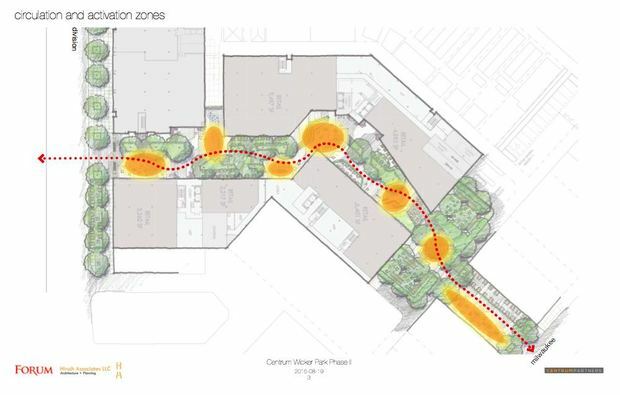 While the site would offer 156 parking spots, the vast majority — 145 spaces — would be underground, with pedestrian exits in the center, forcing drivers to be on the complex's grounds as they leave the subterranean space, "activating more foot traffic," said John McLinden, a principal with Centrum Partners. McLinden said 10 percent, or 27 of the apartments onsite, would be affordable units, as required by the city's Affordable Requirements Ordinance, which mandates that certain new buildings over 20 units either allocate 10 percent of their units as affordable housing or pay $100,000 per unit to a city-managed trust fund that helps to develop low-income housing elsewhere. McLinden pointed out that only 11 parking spots would be above ground, thereby minimizing cars, or at least the visible presence of them in an area that is rapidly becoming "transit-oriented," packed with high-density buildings near the CTA Division Blue Line station. "Forty-three percent of this project is open space, and only a little over 12 percent is for driving, parking and loading," McLinden said. Kate Martin of Forum Studio, a design architect, showed the group examples of ways to engage users of the connection, such as bringing in sculptures and planters that would also double as seating and a water feature, such as a pop-up jet fountain, that she predicted would be a big hit with kids. 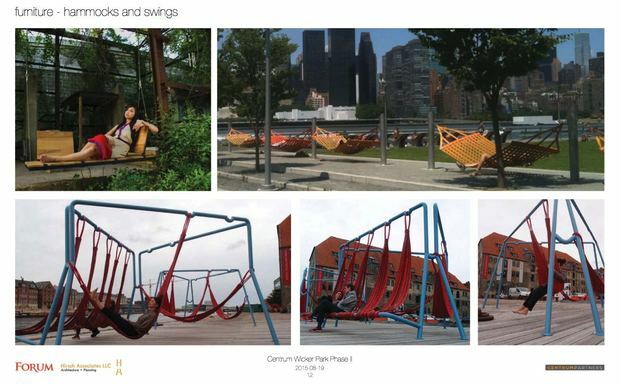 Public hammocks and swings would be among fun furniture options, along with "activation" games like bags, pingpong and a giant chess board, created to further the area as a public space and safe gathering spot, with security and accent lighting. Cautioning that the design is still in its early stages, McLinden said that a lot of things must happen for the project to be a success. "The right restaurants would be needed to make the area destination-worthy. Also, a sign or kiosk to let people walking by on Division and Milwaukee to let them know what's there would be beneficial, since everything will be mostly tucked away from the main streets," McLinden said. In other Centrum news, the group recently sold off the retail portion of the Wicker Commons to a German investment firm for what some sources say was as much as $95 million. Until recently, the mall near Ashland and Division was anchored by a Kmart, which will be replaced by a Lowe's this fall.